This is a simple conclusion, but I really enjoyed Broadchurch, and I’m both pleased and mildly surprised by that. While I liked it well enough after the first episode, I found myself polishing off most of the series a few weeks later in a two day binge and really got hooked in more than I thought I would. Before I talk about what I liked about the show, I’m going to put my initial misgivings right up front and then afterwards I’ll get to how Broadchurch was able to overcome them. First, I’m generally tired of these murder mystery shows. A lot of the blame goes to The Killing, which still leaves a bad taste in my mouth a few years later, but these murder mysteries are just generally hard to pull off. They don’t lend themselves to multiple seasons or even long single seasons. Drawing out the murder mystery too long is problematic because it’s hard to make the payoff seem worthwhile – there’s more pressure on the payoff with every extra episode the mystery takes to unwind. In addition, with multiple seasons, it feels like the murder investigation has to be more complicated than it might well be in order to justify the length it’s taking to play out. Second, I’m tired of characters who fit the type which David Tenant’s cop seemed to be initially. The mysterious anti-hero, House-esque go-it-alone cop, who doesn’t get along with people and has serious personal problems, but is the best damn cop there is so people put up with him (or her). Third, I’m tired of every family member’s personal demons making them all seem like potential killers. In the first episode, it seemed like every member of the family had something to hide, and that they might all be suspects, and it just felt like a TV show getting greedy; absolutely everybody in the town has to be a suspect. The town is big enough; there can be plenty of suspects with room for a couple of people who obviously didn’t do it. Here’s how Broadchurch addressed each of these concerns. First, and this is really at the core of what allows Broadchurch to do a long-form murder investigation show right – eight episodes is the perfect length. There were red herrings, but they were addressed quickly and efficiently and didn’t feel too burdensome to the overall plot. The investigation hummed along without feeling overwrought, and everything was wrapped up at the end without stirrings of some greater conspiracy or convoluted scheme. The case was solved, and the killer has a motive that didn’t involve half the town being in on it rendering the whole situation implausible. Second, while I thought Tennant’s character was a classic antihero cop that breaks the rules, hates every one else, but is smarter than everyone else, he ended up ,well, mostly not being that. He had his moments of playing that character, mostly when he insisted on avoiding dealing with his medical condition and breaking out of the hospital, but mostly he was just an ordinarily good cop who pretty much did follow the rules. He sniped and was a bit rude, but it seemed less like purposeful House-like jerkiness as we got to know him and more like admittedly poor social skills. Third, the family’s issues were resolved sensibly and quickly. There were issues in the husband’s case, but once his affair came out into the light, suspicion of him was quickly dropped, and the show didn’t let the melodrama about the affair drag on. It was relevant, and impacted the grieving family, but it wasn’t the topic of continuing intrigue or concern in the investigation. As mentioned before, but I want to stress its importance, pacing and length was an essential part of what made Broadchurch work. Eight episode was the perfect length to add depth to the mystery without dragging it out. The ending was surprising but didn’t feel out of nowhere implausible, and what made it so powerful was less what actually happened, than its effect on Ellie, who was absolutely devastated. Her personal devastation was difficult to watch but contributed to the strength of the reveal. In hindsight, the foreshadowing was clear when she told Susan Wright that she would have known if her husband was up to something criminal, and it’s absolutely brutal for Ellie to deal with the fact that her husband is the killer, and just be totally and entirely unable to explain how she couldn’t have seen it coming. 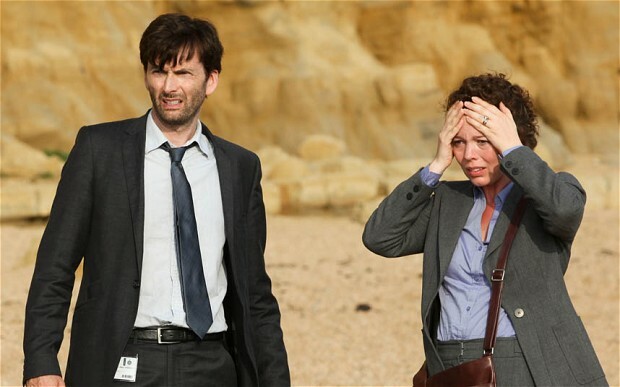 I got hooked on Broadchurch around episode four, and part of why I got hooked was because I knew I was so close to the end. The small town felt small, and the energy of everyone knowing everyone infused the show. Bonds of trust built up over many years broke down quickly while old rumors and gossip rose to the fore. Alec Hardy, as the foreigner, was often the only person abse to step outside of himself and see what was going on in an objective light. I expected to recommend the show only with serious reservations after the first couple of episodes, and I was scared that the further it went, the less I’d want in. Instead, knowing the ending, I feel more confident in recommending the show. More shows need to be this length. Take a weekend, watch it all, and enjoy (I realize you shouldn’t have read this unless you’ve already seen it. Still, recommend it to your friends then).